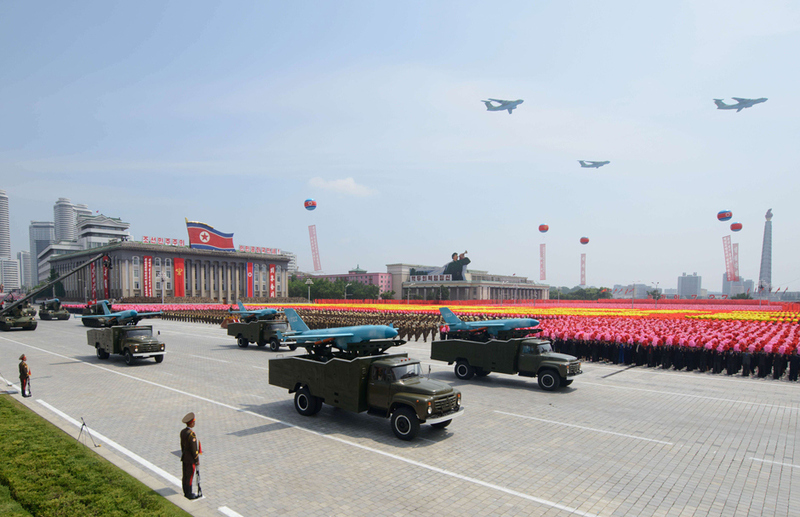 As we have already explained, North Korea staged a huge parade to mark the 60th anniversary of the armistice that ended the 1950-53 Korean War on Jul. 27. Even if the traditional flypast, featured some unexpected and quite interesting, illegally supplied Hughes 500E helicopters, armed with AT-3 Sagger missiles, remained in the dark for 30 years, the parade was a sort-of hoax. Indeed, it looks like the Il-76TD which appeared in a new camouflaged color scheme was borrowed by Air Koryo just to take part to the Victory Day celebrations with the other two cargo planes operated by the state-owned national flag carrier airline of North Korea in military colors. You can see the three planes overflying Pyongyang in the following image. As reported by NKNews.org, immediately after performing the flyby strengthening the lines of the geriatric North Korean Air Force the three Soviet-made cargo aircraft got the civil color scheme again. There are some images around the web showing the planes on their traditional white livery. But even ballistic missiles said to be capable to hit targets in the Pacific and the Continental U.S., paraded through the streets of Pyongyang were probably nothing more than fakes. NBC has recently published an interesting article with a photo analysis of a purported Hwasong-13 intercontinental ballistic missile. Close-ups images seems to highlight several weird details: first of the lack of retro rockets; then forward nozzles on the rocket bodies of two individual missiles placed in different positions; finally, a suspect “undulating skin” near the nosecone.